Hello scrappers and card makers! It's March which in our house means it's time for Spring cleaning and home renovations...so no scrapping for me. Part of the area targeted in our home is a new paint job for the master bedroom. Our sea green and oyster bedroom is slowly becoming aqua and burlap. Now why do you ask does this effect my scrapbooking? Time painting, right? Wrong! While not beautiful , shabby chic and elegant like those magazines and websites we all adore, it's been incredibly functional. A place for everything, and everything (ahem...) in it's place....well most of the time! Chalks, Shimmerz, paint, stamps, smooch, brads, glitter, inks.... all tucked away in a box. 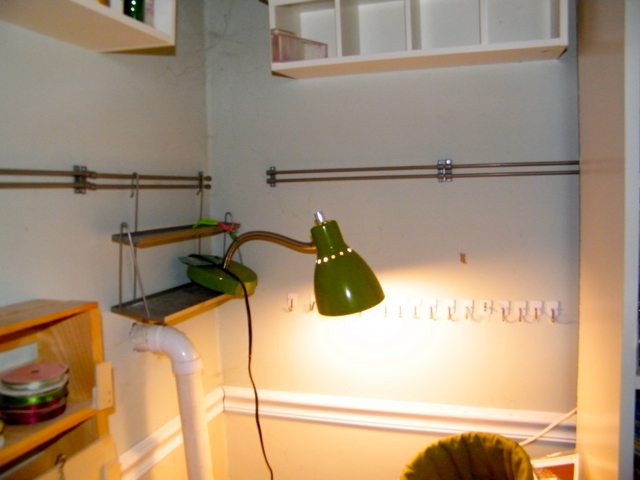 All those rails and hooks need to come down and paint applied before I can unpack againk...and therefore scrapbook with any kind of sanity! 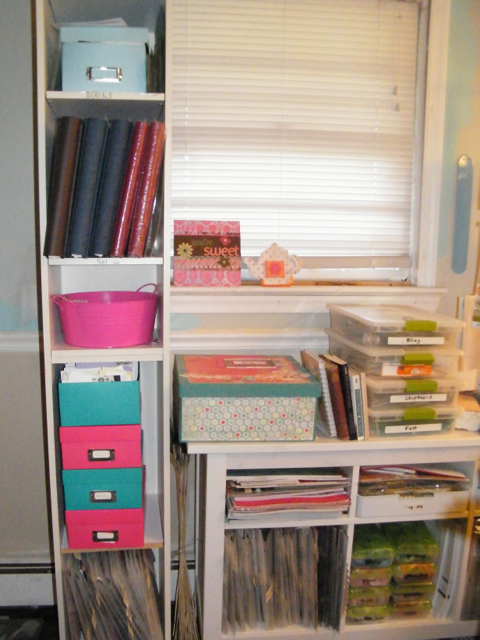 But since it's all coming down, I decided maybe I can reorganize, make it prettier, more inspirational to work in. So I'll take a before picture and you all can see things slowly unfold. Thanks for reading! And while you're at it, why not answer that age old question, how do *you* organize your supplies? PS The good news is, next month's card workshop was mostly working with scraps. So - Hooray! The samples are done! It will be posted in a separate thread so it's easy to find. Class is April 30th and will cost $8.00.